Rain resistant cycling shorts are becoming more widely available, due to the development of better fabrics and material coatings. Weatherproof protection, like that provided in the Cafe du Cycliste Jeanne Bib Shorts, helps to make those damp, windy and cold days that bit more manageable. Not many people really enjoy wet weather cycling, but there are things that can be done to make it more comfortable. Indeed, with the right kit, it's quite possible that you'll learn to embrace the challenge of riding in inclement conditions. 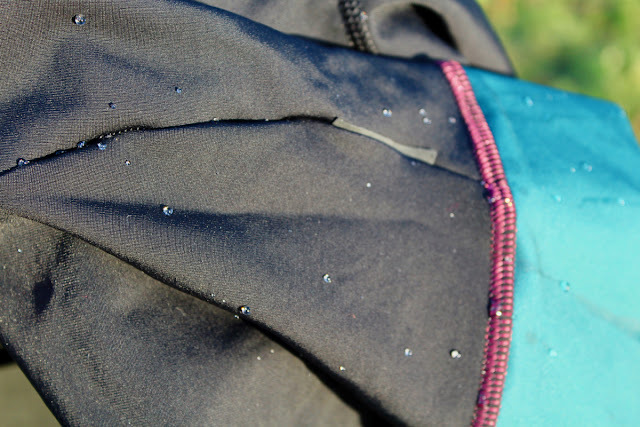 The Jeanne Waterproof Bib Shorts use a water repellent DWR fabric, with a Thermo-Roubaix fleece lining. 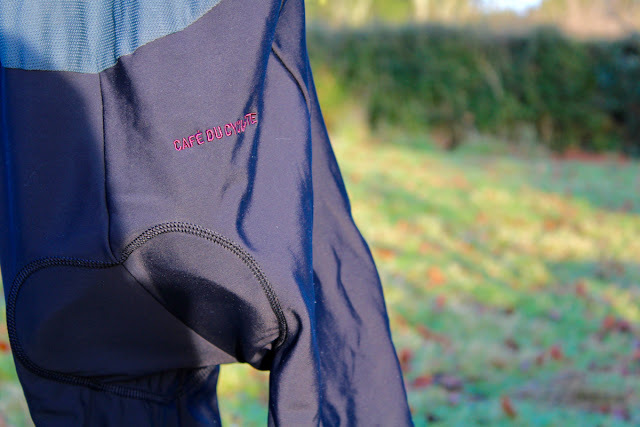 The combination provides a protective, stretchy, but highly breathable piece of race-wear; which will help aid comfort in challenging riding conditions. The chamois used in the bib shorts comes from the world-renowned Italian company CyTech. 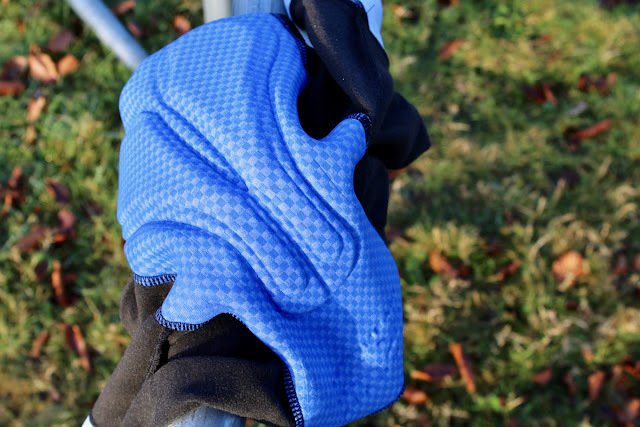 It is one of their range-topping pads, and uses a mix of three different foam densities and 'Cool Cube' technology, to provide comfort for long winter endurance rides. It's one of the best pads that I've tested, and have experienced it in a number of different brands of shorts. The combination of the water and wind resistant fabric, and the high-end comfortable seat-pad, means the Jeanne Waterproof Bib Shorts from Cafe du Cycliste have all the component parts of a great pair of wet weather riding shorts. So how do they feel? Do they work? Firstly, I should say that the Jeanne Bib Shorts feel very comfortable. 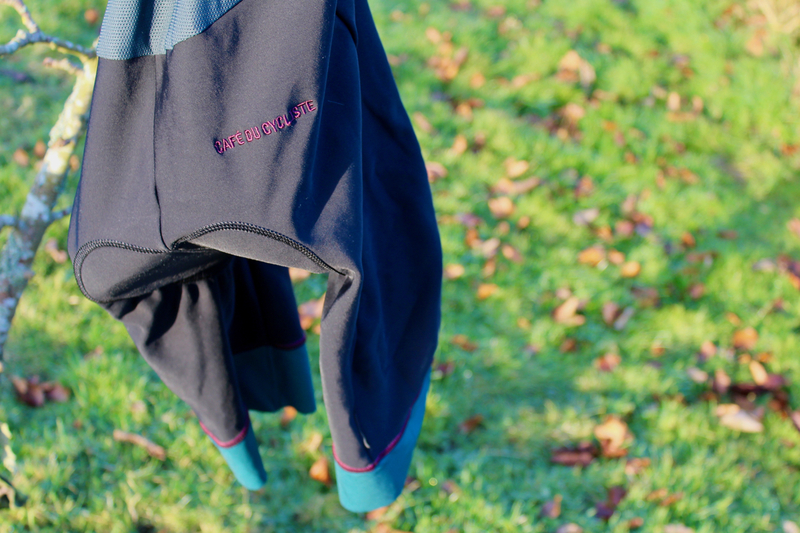 Unlike some rain resistant fabrics, the ThermoRoubaix coated Lycra seems to retain good stretch properties, and the low-profile leg grippers keep everything firmly in place. The bibs also feel good around the shoulders and torso. The mesh braces and multi-panelled cut, mean that they retain a close snug fit, without restricting movement or reducing breathability. The back of the shorts has been cut slightly higher, to provide added warmth in cold conditions. Meanwhile, the front has been cut with an aero-tuck in mind, so that there is no bunching of material when seated on the bike. The fit suggests that these are a pair of bib shorts that have been designed by cyclists, for cyclists. The weatherproofing seems to work well, too. I have worn these on wet and windy winter rides, and my thigh muscles have remained warm and well protected. 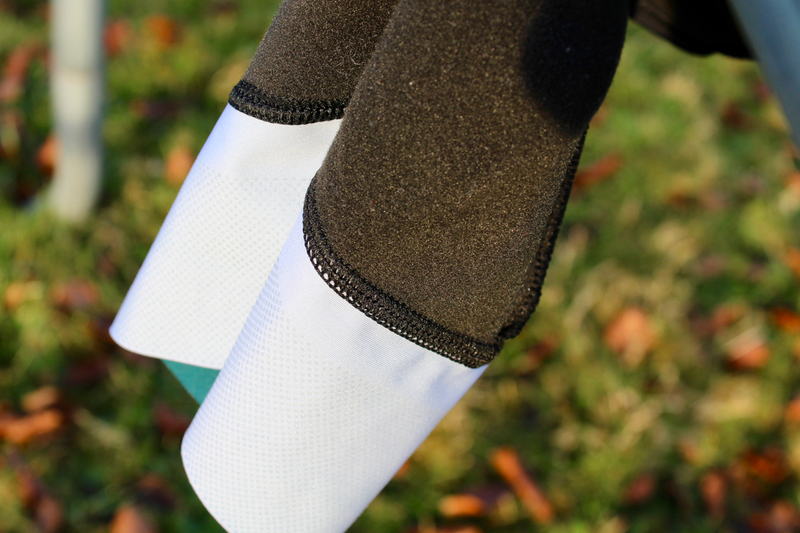 Partnered with a pair of rain-resistant leg warmers, you get a 4 season package; to keep you riding through the winter storms. Size tested: Medium (my measurements are listed here). 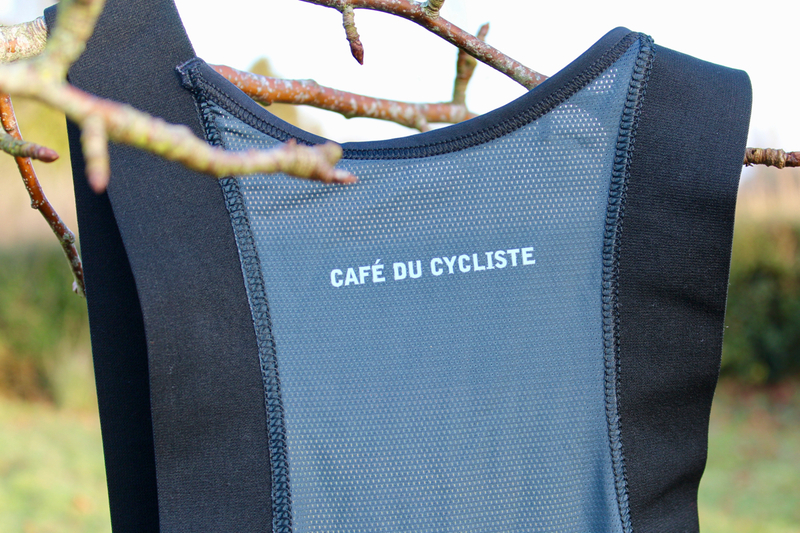 Taken as a whole, the Jeanne Waterproof Bibs from Cafe du Cycliste are a piece of well executed all-weather cycling kit. The fabrics work well at providing protection and insulation. Then, the fit means that they feel supportive and comfortable, even for long hours in the saddle. Available in a variety of colour-ways, including the nice teal green leg gripper model featured here. 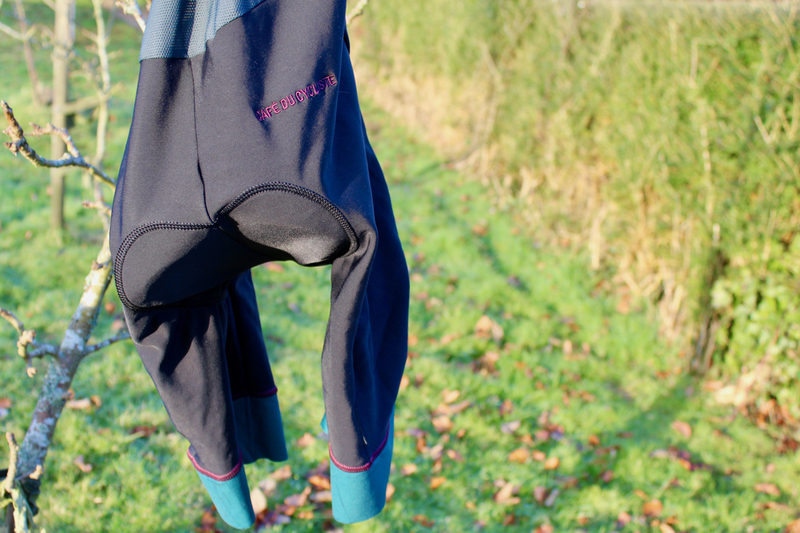 The Jeanne Waterproof Bib Shorts are a stylish and very useful addition to a racing cyclist's wardrobe.